​Tom Cruise is back with the sixth instalment of the ever-popular, ever-growing, and ever-more-critically-acclaimed Mission: Impossible series. As Ethan Hunt he skydives, shoots, runs, fights, and flies his way to saving the day, with the help of series regular Ving Rhames, old-hands Simon Pegg and Rebecca Ferguson, and newbie Henry Cavill, who’s acting prowess still only seems to extend to two moods: refined, sensible and detached, and grr angry. Still. At least they kept the moustache on his face this time, instead of letting this happen. Together, they fight to stop nuclear annihilation and a host of faceless bad guys, led by someone we never quite meet, and never quite understand. Plot twists, red herrings, and double-bluffs are all the rage here, so much so that it felt nearly impossible to quite follow whatever emotional journey was happening, while keeping the narrative mysterious enough that I simply stopped worrying, and began to let the film wash over me like a slow unstoppable tidal wave of action and explosions. Quite how there continues to be traction for a series that basks in and references its own dizzying heights of outlandishness is, I admit, beyond me. 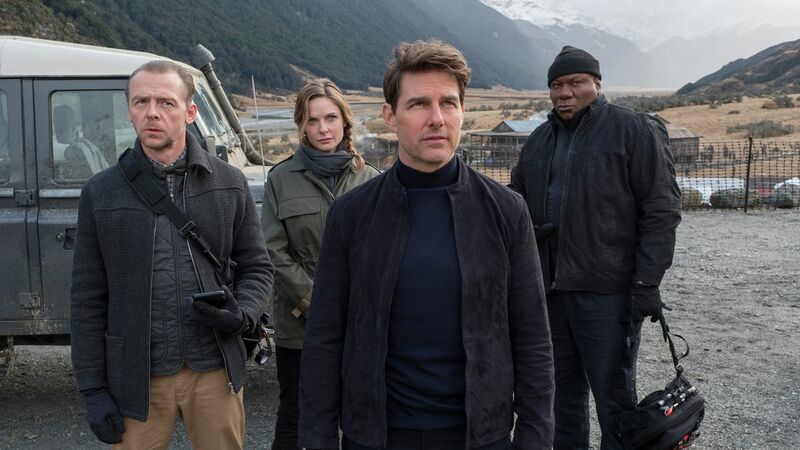 Each chapter seems to step up it’s game in terms of action and scale, much like the Fast & Furious franchise has done, and Mission: Impossible’s ever expanding cast attests to that. It does well, however, to keep Cruise centre-stage. Despite appearances to the opposite, and a public affiliation with a religion that increasingly resembles MLM schemes on a bigger scale, Cruise can in fact act, and act well. This has always been obvious, I think. While the late 80s were filled with his first forays into action, his decisions were unequivocally artistic in nature. Performances in The Color Of Money, Rain Man, A Few Good Men, Interview With The Vampire, Born On The Fourth of July was all solid acting, and his best performance to date can be found in 2004’s Collateral, directed by Michael Mann, which served as a reminder of the depth and quality Cruise was capable of. It’s not like he doesn’t know what makes a good film. Cruise is an obsessive cinephile, and has been responsible for the release of several pictures the public would never have seen, simply because he seeks them out and uses his clout as a producer and star to ensure their release. Taking all of this into account, Mission: Impossible - Fallout is still ridiculous, over-the-top, outlandish action but Cruises performance is nothing if not committed. Evidence of this can be found in the film’s (genius) marketing of the fact he does his own stunts: from breaking his ankle jumping between buildings (and proceeding to run off camera on it, and using the take), to actually skydiving solo, to learning how to fly a helicopter and actually flying it for a stunt. It’s a major part of his appeal, as cinema-goers have reached a sort of passivity to CGI action. It’s been a few decades since the advent of convincing special effects, and until something comes along that sets the benchmark truly higher, audiences have grown tired of seeing things they know are fake. Far better, then, to mix as much live-action into your impossible missions as possible! Hats off, I think, to Christopher McQuarrie, who alongside George Miller and maybe the Russo brothers, has one of the best eyes for directing action I can think of. It’s kinetic and chaotic, and at its heart a deeply stylistic way of showing us everything. Contrary to the explosive, unending (sometimes tedious) action that appears on screen, McQuarrie’s obvious affinity for cars reminded me of the late Abbas Kiarostami, who loved them too. They both treat cars with reverence and respect: McQuarrie for how they can mirror character emotion, for their power and loudness, and Kiarostami for how they facilitate conversation, the symbol of what they can mean to people. Both of these directors love how cars can drive a narrative as well as a character. Of course, several directors display such affinity, but I will never shy away from dropping Kiarostami anywhere I can, if only because it means you might watch something of his. In the end, Mission: Impossible - Fallout is bolstered by its conceit of outlandishness, and with confident, impressive direction it ends up being another solid instalment in a franchise that deserves the success it gets, if only because there’s nothing else like it in Hollywood. And honestly that's a good thing.